Paul Morphy’s career was meteoric. He burned brightly for a short period of time, in the mid-19th century, and then never played again. Moving him up or down this list depending upon how much or how little you value longevity is quite sensible. Morphy defeated all the best players of his day with the exception of Howard Staunton — who managed to avoid playing Morphy. Most historians give Staunton no real chance of ever being able to defeat Morphy in a match. What set Morphy so far above his contemporaries wasn’t that he won but how he did it. Morphy played scintillating chess. His games still serve as classic examples of how powerful rapid development can be. After defeating the best and the brightest, Morphy retired from chess to set up his law practice in New Orleans. Unfortunately, what many believe to have been serious mental health problems surfaced and haunted him for the remainder of his days. 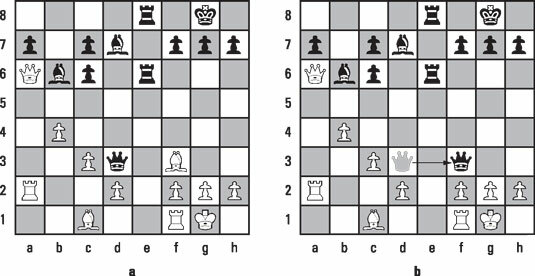 The position in part a of the following figure occurred in a game between Louis Paulsen and Morphy in 1857. Notice how Paulsen’s white bishop on c1 is in its original position and is blocked by white’s own pawns. Paulsen is trying to drive Morphy’s black queen off of the d3 square, so he can move his d-pawn and get that bishop into the game. Morphy, however, has something else up his sleeve. Black sacrifices his queen to get at white’s king. Morphy plays 17… Qxf3. This sacrifice of the black queen rips white’s kingside open and exposes the king to a relentless attack. Black attacks the rook and tightens the noose around the king’s neck in the process. Although 22… Rg2 would have led to the quickest checkmate, white was compelled to resign in any case after another handful of moves.